Just one day after the controversial firing of NPR’s Juan Williams hit the media airwaves, PINK sat down with the organization’s first female CEO, Vivian Schiller, for an exclusive interview. As the first media outlet she spoke with before a making speech to the Atlanta Press Club last week, Schiller clearly appreciated the chance to focus on women’s advancement rather than the growing controversy, and now admits she could have handled the ordeal better. Here, the most powerful woman at NPR talks about leadership and life balance, and how she plans to double NPR’s listeners in the next decade. VS: It’s very collaborative. It’s the opposite of command-and-control. That doesn’t mean I don’t make the tough decisions in the end, but I like to hear a variety of opinions and hash things out with my senior colleagues on the team and talk things through. I’m a big believer in over-communication and transparency. Too many times, I’ve seen leaders holding on to information rather than sharing it because they feel that it makes them appear more powerful. I think the greatest power is in sharing information. My rule of thumb is, unless something is confidential, I share it with the staff. I do staff meetings at NPR all the time. Rather than saying, “What can I share?” I start with, “What can’t I share?” and tell the rest. The more people know how we operate and the kinds of choices, challenges and opportunities we’re faced with in management, the better and more engaged they can be, and the stronger we are as an organization. PINK: What is the secret to your professional success? VS: I have no idea. I just feel incredibly fortunate that I’ve been reasonably successful in various walks of my life. While I don’t have the answer to what the secret is, there are some characteristics that have been with me wherever I’ve gone: to follow my passion and to love what I do. I would have a hard time working for an organization where I didn’t deeply care about the mission – that is much more motivating to me than money. I’ve also been very curious and followed my instincts, and I’ve always had a group of trusted people in my life – family friends, colleagues or former colleagues that I can turn to for advice. I believe in transparency and collaboration – those are my values, whether they are secrets to success is for someone else to judge. PINK: What is the biggest dilemma facing professional women today? VS: The new issues for women are exactly the same as the old issues for women: trying to figure out how we can be successful and fulfilled in all aspects of our lives. Many men, including my husband, no longer follow the cookie-cutter idea of expecting the woman to take care of the children and the house. Nonetheless, I feel within myself a personal draw to spend more time with my family. Wherever I am, whether I’m working or with my kids [Jared, 14 and Elizabeth, 16], I feel a little bit guilty about the thing that I’m not doing. The fact is that you cannot have it all. There’s no such thing as having it all. Life is a series of compromises that we make based on the things we care about most deeply. I struggle with it daily. VS: One is to try not to feel guilty, because guilt is unproductive. It doesn’t solve anything. The other, which I struggle with, is to always have your head wherever you are. Because I’m in the news business, I can never shut my phone off, but that doesn’t mean I need to keep checking e-mails incessantly. PINK: You were the first general manager of the Discovery Times Channel and the senior vice president of NYTimes.com. What is the best business advice you’ve ever received? VS: To not let others pigeonhole me into a career path. There are no rules in terms of how you manage your career. You’ve got to trust your instincts and not follow some kind of formula. I have felt pressure to choose between editorial, creative and business. Some people I respected advised me that, if I didn’t choose, it was going to hold my career back. I couldn’t choose because I love both aspects of the media business equally. I never did choose, and actually it’s served me well. Now, at NPR, I’m able to engage in both. PINK: NPR reaches around 27 million listeners a week. You’ve said you want to almost double this number by 2020. How do you intend to do this? VS: Our goal is very straightforward: to provide more news and information to more people in more ways. It’s about expanding our audience by being where the audience is. We’re very strong in radio. That the lion’s share of how people get news and information from NPR. But we’re also pushing very aggressively on whatever platform anybody chooses to consume us on. If you want NPR on your iPad, we’ll be there for you. We feel like [NPR is] a place that people of every socio-economic group, every race, every ethnicity and age can feel like there’s something there for them. PINK: Are there any specific ways you’re trying to target women? VS: I don’t think we have a woman problem, in terms of diversity. We are a very female organization, though there’s never been a female CEO. A lot of the voices on the air are women and we cover a lot of stories that are of interest to women, and the demographics of our audience reflect that. PINK: What is it about your background that has resulted in your choices and success today? VS: I was really encouraged by my parents to be interested in a lot of things. I pursued a liberal arts education. I never felt pressured, nor do I now pressure my own children, to think about, “What’s your career going be? What do you want to be when you grow up?” I’m actually quite the opposite: I’m discouraging them from trying to make any decision and instead to be open-minded and use their time now in high school and in college to explore and find where their passion is. PINK: What passions led you to pursue a liberal arts education? VS: Every month, it was something different. I’m a dilettante of the first order: I’m interested in everything and I’m curious about so many things. That’s one of the hallmarks of journalists. It took me a long time to discover journalism, but every month I was on to something else. I’m “a mile-wide and an inch-deep:” I’m not an expert in anything but I’m interested in everything. PINK: How do you rejuvenate yourself? VS: Spending time with my family and my kids. I just can’t get enough of them. I don’t have huge hobbies… I don’t really have time for it. My kids are big into sports. They’re cross-country runners so I go to their meets, and we love to travel. We went to Italy this summer. We like to explore – go for hikes, go to movies. We love having people over. Our house is constantly filled with friends, dogs, kids and neighbors traipsing through. It can be hectic sometimes, but it’s a different kind of hectic than work, so I find it very energizing and relaxing at the same time. VS: I was a Russian interpreter. While exploring different things in college, I took a Russian class and fell in love with it and decided that was my major. I just followed a passion without a plan, which has been a consistent thing in my life and my career. I did graduate work in what was then the Soviet Union, as an interpreter and a tour guide. It was a really great experience. PINK: What is one personal goal you have yet to achieve? â¨VS: I’d like to become a good cook. I’d like to be one of those people who can just whip up a fabulous dinner and I haven’t achieved that goal yet. 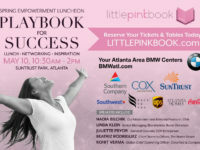 PINK: Any words of advice for businesswomen? VS: Figure out what you want to do. People often say, “Life is short,” but I think it’s quite the opposite. Life is long, and that’s a wonderful thing. Don’t spend it pursuing somebody else’s idea of what we should be doing. Spend your long life pursuing something that you care deeply about, and that will give you lifelong satisfaction, much more so than money. VS: Success is finding that elusive balance between being passionate about what you do and being a good, ethical person who treats other people with attention, kindness and respect. The balance between those two things, to me, is the ultimate success.